In 1913, Mr. A. Howard Sadler a realtor/developer arrived in Manhattan Beach from Pasadena. Taking advantage of the rail system, he brought prospective land and home buyers to the shore, showing them the value of investing in the Manhattan Beach community. The town site had been promoted in the past as a unique place in the South Bay, but it was Sadler who brought it to a new height. With his 1913 promotional piece, “Manhattan the Beach Worth While, Where the Pacific Ebbs & Flows,” he elaborated on this splendid town of the future. An excerpt from the pamphlet reads: “Every safeguard is being thrown around Manhattan to make it a city of home, “A Home City” in all that the term implies. There can be no saloons within its borders, no resorts or vice, and all features of rowdyism will be effectually eliminated." Sadler built a home at 452 Maine Avenue for himself and took great pride in creating other bungalow style homes in the area. He was once quoted as saying, “Manhattan is the coming beach of the South Bay…” and that he wanted to be strongly with its progress. In 1914, two of the areas Sadler developed were in the vicinity of 21st Street, Marine Avenue, and Grandview Avenue, as well as in the Manor Manhattan Tract. The Tract was a restricted sub-division proclaimed to be one of the most desirable residential sections in the city. Sadler’s homes were described as the most beautiful in the district. This charming section in Manahttan Beach is now known as the “Gas Light District,” which was created in the 1960’s. It is bordered on the south by 21st street, on the North by 24th Street, Highland Avenue on the West and Blanche Road on the East. Also, in 1914, Sadler’s construction of a business block on 22nd Street (now Marine Avenue) set a trend in the development of public buildings. In sharp contrast to the residential homes that Sadler had been constructing this 66x100 foot development contained eight stores forming a two-story city block. 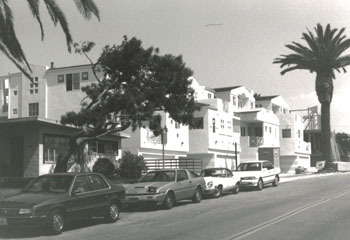 Four stores were located on Ocean Drive and four stories on Marine Avenue. Sadler’s use of the Spanish architectural style gave the project a look of elegance, so much so, that the City Trustees decided to occupy the entire second floor. This location served as the City Hall quarters until the new City Hall (built in 1915) could be completed. 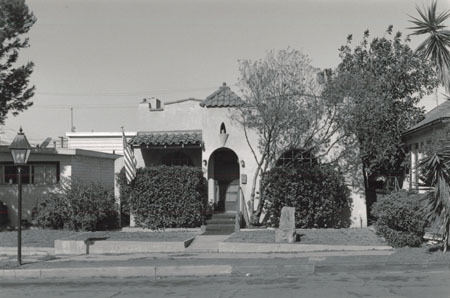 Sadler continued to develop the sand dunes and build family units with a typical Spanish Revival architectural style constructed of stucco that reflected the bright and suny atmosphere of the California southland, the arched entry and windows, title roofs historical homes, located in the 400 block of Marine Avenue were demolished in 1986, to make way for condominiums.